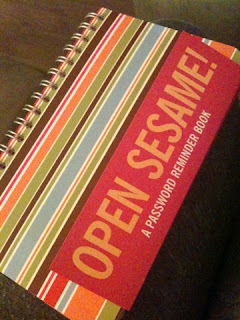 For a couple of months, I wanted to make a password reminder book. I didn't want to spend money to buy an actual book. I got as far as to designing a template but needed to print and bind it. Well, this morning I went in to Chapters to look for a 2012 agenda (they aren't selling them anymore) but instead found a Bob's Your Uncle password reminder book. It was regularly $16.50 but it had a 50% off sticker. When the cashier rang it up, it came out to $4.13. BONUS!!! At this price, it makes it so much more worth it to buy it instead of making it. What do you use to remember all of your passwords? i would probably lose that book! most of my passwords are similar (except for my banking) so it's pretty easy to remember. nothing, that's why i ended up with having so many e-mail addresses before because i couldn't remember their passwords then i just end up creating a new e-mail. thank god i only have three now (personal, work and social media). i don't write down passwords for any financial accounts because you never know where i might lose these things. Most definitely, I would never write down stuff for financial things. I wrote down usernames and passwords for stupid stuff like Pinterest and anything that doesn't have financial info tied to it. 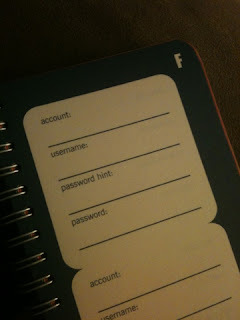 What I like in this book is that there is a password hint section so I don't have to actually write down the password. That's SO cool! I dont use anything but my brain because all of my passwords are pretty much a variation of the same thing...which my husband constantly yells at me for, haha. Oh my gosh Leesh...this is a great idea! I definitely need something like this for all of my online bill paying with all the different websites.